TOKYO - A giant bluefin tuna fetched a record 32.49 million yen, or nearly $396,000, in Tokyo on Wednesday, in the first auction of the year at the world's largest wholesale fish market. The price for the 754-pound tuna beat the previous record set in 2001 when a 445-pound fish sold for 20.2 million yen, a spokesman for Tsukiji market said. "It was an exceptionally large fish," said the official, Yutaka Hasegawa. "But we were all surprised by the price." The massive tuna was bought and shared by the same duo who won the bidding for last year's top fish: the owners of Kyubey, an upscale sushi restaurant in Tokyo's Ginza district, and Itamae Sushi, a casual, Hong Kong-based chain. Reporters thronged Hong Kong entrepreneur Ricky Cheng after his big win, which reflects the growing popularity of sushi around the world, particularly in Asia. "I was nervous when I arrived in Tokyo yesterday, but I am relieved now," he said after the auction, which began shortly after 5 a.m. The giant tuna, caught off the coast of northern Japan, was among 538 shipped in from around the world for Wednesday's auction. The record-setting price translates to a whopping 95,000 yen per kilogram, or about $526 per pound. Japan is the world's biggest consumer of seafood, with Japanese eating 80 percent of the Atlantic and Pacific bluefins caught. The two tuna species are the most sought-after by sushi lovers. Fatty bluefin - called "o-toro" here - can sell for 2,000 yen ($24) per piece at high-end Tokyo sushi restaurants. Japanese wholesalers, however, face growing calls for tighter fishing rules amid declining tuna stocks worldwide. In November, the International Commission for the Conservation of Atlantic Tunas voted to cut the bluefin fishing quota in the eastern Atlantic and Mediterranean from 13,500 to 12,900 metric tons annually - about a 4 percent reduction. It also agreed on measures to try to improve enforcement of quotas on bluefin. 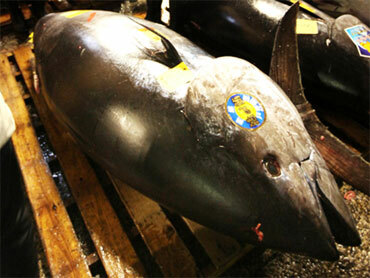 The decision was strongly criticized by environmental groups, which hoped to see bluefin fishing slashed or suspended.